I have been on the lookout for musical note nursery ideas ever since one of my favorite musician friends told me that she is expecting and needed my help in decorating her nursery. Knowing her love of music, there is really no need for me to ask what her nursery theme will be..it's pretty much a no-brainer. But I did need to find out which direction she will take the theme and whether I should be putting together modern or vintage, rock and roll or classical musical nursery ideas. This multitalented mother-to-be can hold her own in everything from a jazz band to heavy metal so I wasn't sure what her decorative taste for her baby's nursery might be. AS things turned out, she has decided not to focus on a particular genre of music but to decorate using individual musical notes as accent pieces. Imagine my delight when I looked up on these musical note nursery ideas shared by Jaclyn on her blog, Faith*Hope*Love*Happiness. She called the tutorial that tells you how to take old (read: ugly!) 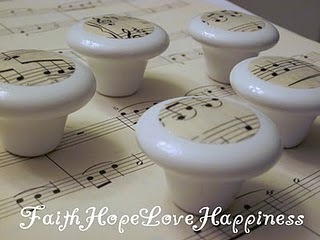 knobs and give them a makeover using sheet music. 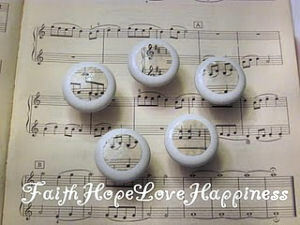 The results are musical note themed drawer pulls that would be perfect for a shabby chic or vintage music nursery theme. My plan is to visit the used book store and find an old (partially damaged) music book with pages that I can recycle and use the instructions in Jaclyn's knobs tutorial to personalize my musical friend's baby dresser! I can't say whether my efforts will produce results as cool as the originals since my crafts skills are not that great but the instructions are excellent and I'm going to give it a try! Join in and write your own page! It's easy to do. How? Simply click here to return to MUSICAL THEME NURSERY PICTURES and DECORATING IDEAS.